How to get there: The city of Molde is a good point of departure. Drive about 13 km from Molde (toll crossing, under-water tunnel plus bridge, NOK 55 in 2003) to Røvik east on Hwy. 64. Make a left here on the road that heads to Fannefjorden and Kortgarden, the road sign says "Kleive". There is a nice church right next to the intersection. Drive slightly less than 12 km to Kortgarden and find a small road heading uphill to your right. The road has a sign saying "Nakkvegen", continue about 800 meter to the top. Take a sharp right turn and observe that the road continues as a toll road (NOK 20 in 2003). Drive along this road until the road forks, a sign saying Trollvatnet points left. Take this road and drive until a the end of the road (about 2.2 km from the start of the toll road) near a cabin where there is parking to the left. This place is called Tjørhjellhaugen. GPS coordinates of parking are: N 62:45.707, E 007:37.074, the elevation is about 185 meter. Route description: From the parking area at the end of the road, go back along the road passing the cabin. A bit further along, you will locate an old track that heads gently downhill in the direction of the mountain. Shortly, the track crosses a creek on a wooden bridge and turns into a trail that heads up across a couple of (wet) meadows. The trail heads more uphill among trees and follows the creek (from Trollvatnet above) on its east side (left side facing uphill). Higher up, the trail crosses the creek and climbs to the lake Trollvatnet (GPS: N 62:44.895, E 007:37.708). 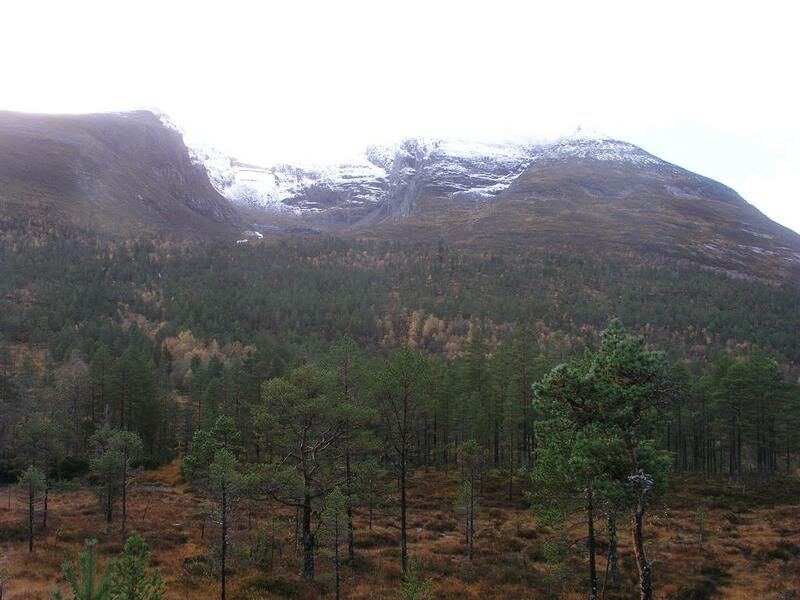 This is a nice place, the Skåla mountain is towering above with ridges exteding both ways, thus the name Skåla. From the lake, the trail continues up the ridge that is directly to the right as you face the mountain from the lake. The trail is marked with small cairns in several places. It sticks to the high ridge and is fairly steep, but with no difficulties. The entire climb stays at (YDS) class 2. Higher up the ridge levels off, the drop to your left (towards Trollvatnet) is impressive. 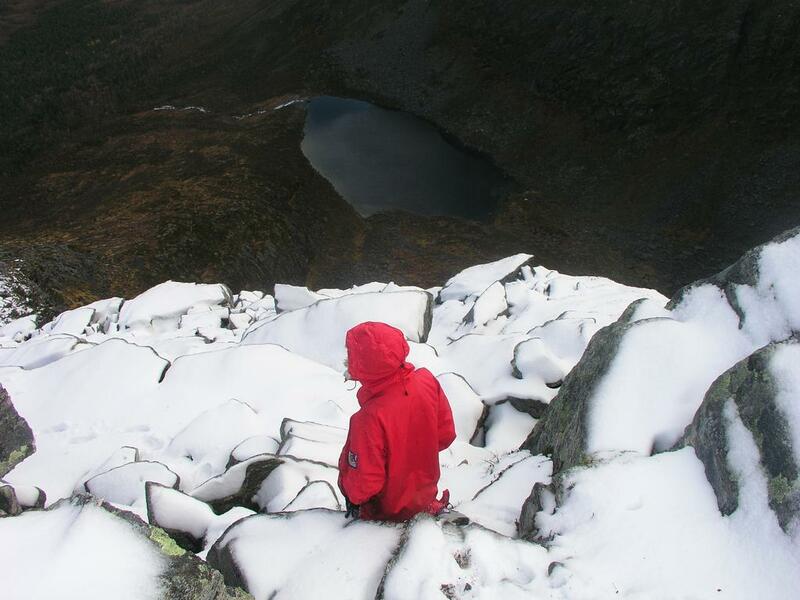 The last part is getting you up onto the rounded summit. The summit plateau itself is fairly flat and quite large with several cairns. Comments: I did this climb with my son Pål Jørgen, age 14. We started at 0700, it was pretty dark in the forest as we started out across meadows and creeks too far east (we did not find the proper trailhead). At the summit after 2:15, with very low visibility. 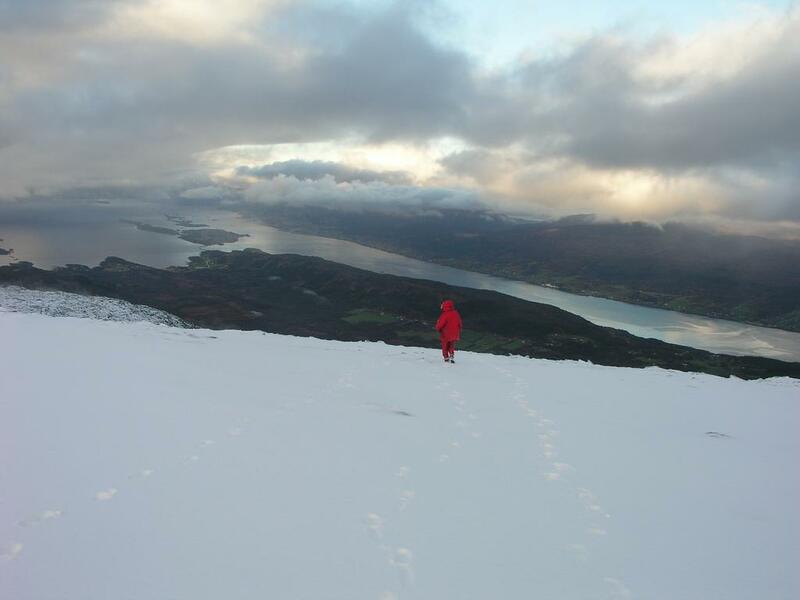 We departed after 15 minutes and actually had a brief view of the fjords from the summit. The return hike took 1:20. The mountain Skåla, as seen from the trailhead. The lake Trollvatnet is straight up the middle. The ascent route stays on the ridge on the right. The mountain Skåla, as seen from the lake Trollvatnet. The route proceeds up the ridge on the right side. 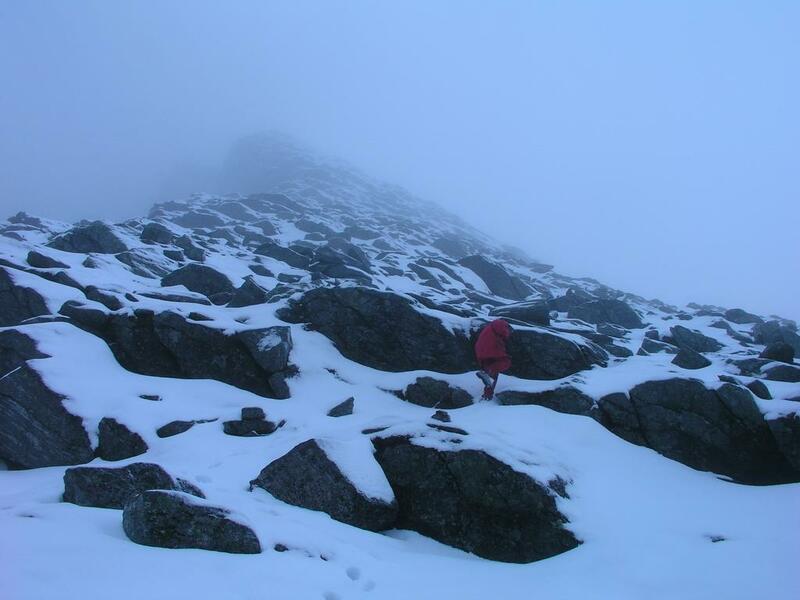 Pål Jørgen has started on the snow struggle up the ridge. 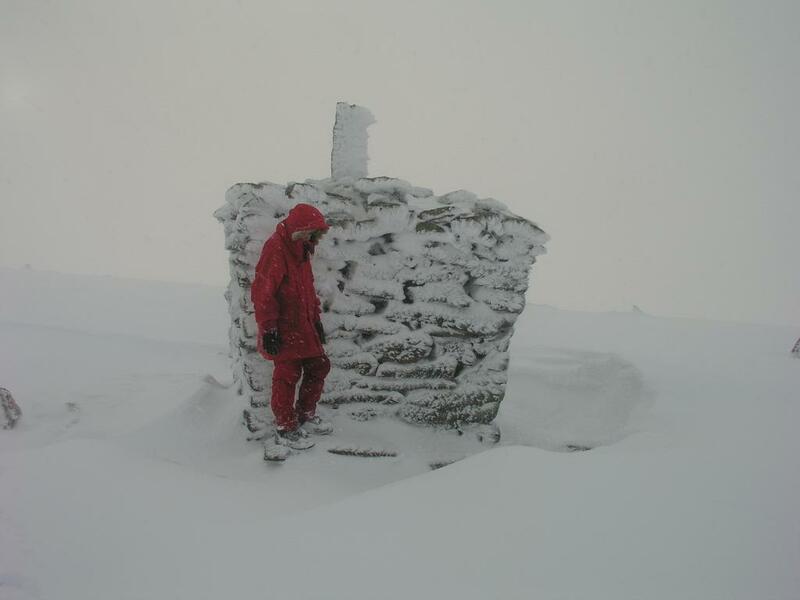 Pål Jørgen next to the second summit cairn. 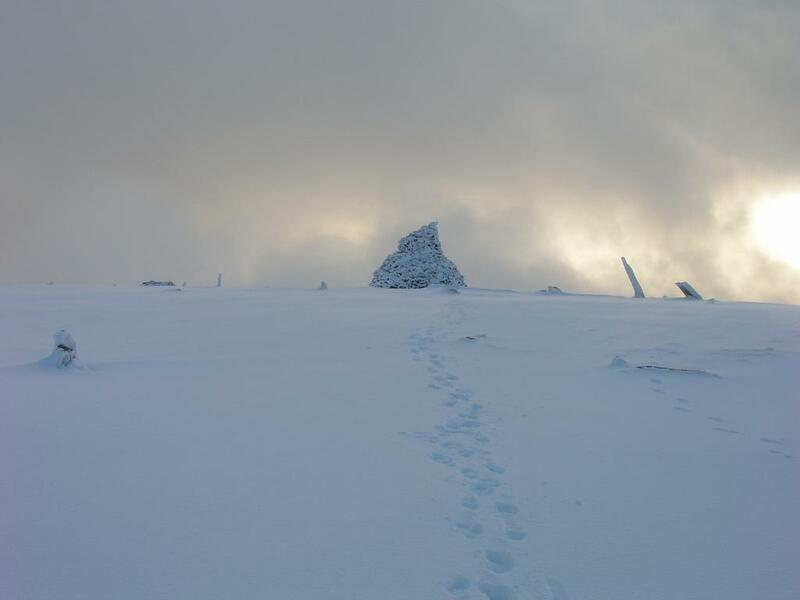 The huge summit cairn, looking back. Fjord view, as we left the summit plateau. The ridge, the route follows this ridge (left side of picture) all the way down to Trollvatnet below. Panorama view of Fannefjorden, the city Molde is across this fjord quite far out.